B- - The film adaptations of J.K. Rowling’s staggeringly popular fantasy novels have perfected a remarkable, distinctive formula. Once the banal hand of Chris Columbus was pried from the franchise following Chamber of Secrets, every chapter in the saga has exhibited the same characteristics: an ever-burgeoning cast of wizards, monsters, and other sundry characters seemingly destined to encompass every British thespian of note; maddeningly convoluted plots, conveyed so sketchily that only devoted fans of the books can hope to comprehend what the hell is going on; stunning, inspired production design overseen by the invaluable Stuart Craig; and exceedingly game, unfailingly charming performances from series principals Daniel Radcliffe, Rupert Grint, and Emma Watson. The seventh film in the series, the first of a two-part finale, sticks closely to this template, a thoroughly unadventurous and (at this late date) sensible approach. Having shepherded the saga through its previous two chapters, director David Yates has learned that such a formula reliably bestows a patina of epic artistry on the franchise, inoculates it against conventional criticism, and just happens to reap billions of dollars. The films cannot be dismissed as trifling—they represent, for better or worse, the most ambitious work of long-form fantasy cinema in history—but as the series reaches its end, their significance as entertainment to viewers not already hooked on Harry’s adventures is doubtful. Which leads to the most essential question regarding Harry Potter and the Deathly Hallows: Part 1: How good is it, when approached strictly as the penultimate entry in the broader saga? The answer: Exactly as good as it needs to be to bring loyal Potterheads (including yours truly) back for one more outing. The latest chapter finds Harry (Radcliffe), Ron (Grint), and Hermione (Watson) forsaking their seventh year at Hogwarts for a fugitive life, now that Albus Dumbledore (Michael Gambon) has been slain and the wizarding world has been overrun by the forces of the Dark Lord Voldemort (Ralph Fiennes). 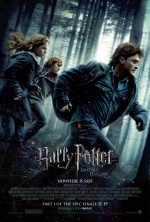 Breaking free from the episodic design of the previous films, which were snugly reliant on the discrete Hogwarts school years, Deathly Hallows launches the heroic Trio out into a wider and more perilous world. This, of course, dovetails nicely with Harry’s emergence from adolescence into adulthood, with all the frightening responsibilities and uncertainties that transition entails. Appropriately enough, the world beyond Hogwarts has become forlorn and yawning, an exposed wilderness with a distinctly Northern tinting. Treacherous forays into the urban bustle of the Muggle world provide only brief respite for the Trio, who wander aimlessly through a landscape of wind-battered coasts, gray volcanic plateaus, and dismal winter forests. Beyond the cities, signs of life are scarce, and as our heroes squat under drab concrete overpasses and trudge through desiccated fields, their Britain seems a post-apocalyptic environment. Lack of direction is one of the film’s dilemmas, for Harry, Ron, and Hermione have no better sense for how to move against the Dark Lord than at the conclusion of the previous chapter. Whether out of prudence or obstinacy, Dumbledore provided only the barest hints as to how Harry was to proceed after his death. One of the primary problems with Rowling’s latter novels is the multiplication of MacGuffins: there are far too many Important Items whizzing through the plot, and an even more unwieldy number of Important People and Places. Deathly Hallows: Part 1 presents the bewildered viewer not only with the seven Horcruxes of Half-Blood Prince (items into which Voldemort has placed fragments of his soul) but also a magical sword necessary to destroy these foul objects, not to mention the three titular Hallows, legendary wizard artifacts that will become crucial to the plot. Even to Potterheads it can be dizzying and needlessly elaborate; to the uninitiated it’s virtually guaranteed to be outright incomprehensible. (At least Tolkein remained resolutely focused on the One Ring.) Yet despite all these Objects of Desire that stud the narrative, Harry and his friends spend much of Deathly Hallows mired in their own imperfect knowledge, uncertain of the next step on their quest. Unfortunately, this means that there is a lot of running and hiding and reading, peppered with spontaneous and ill-advised gambits, which makes for a prolonged, often directionless story. While there’s an undeniably potent correspondence between Harry’s predicament and the often doubtful shift to adulthood, there’s little pleasure in watching the plot inch along stiffly for two and a half hours, especially compared to the relatively lively pacing and drama of Half-Blood Prince. Structurally speaking, these flaws are entirely understandable, given that Rowling’s series has always been presented less as a thrilling Heroes’ Journey than an intense, fantastical allegory for the process of growing up, with a deep debt to the tradition of English boarding school stories. Unfortunately, this route often makes for some exceedingly lifeless “adventure” in what is ostensibly a fantasy adventure series, and never more so than in Deathly Hallows: Part 1. As with all the post-Chamber Potter adaptations, the latest film compels not by faithfully recreating scenes from the novels, but by its omissions and digressions, and by its sumptuous employment of dazzling design to elaborate on Rowling’s already crowded fantasy universe. Even at a presumed running time of five hours over two films, the seventh chapter elides as much as it dares. Meanwhile, Yates emphasizes not only the despair of fresh responsibility, but also the circuitous, mythic dimension to Rowling’s saga. Everything old is new again: People and places long neglected suddenly snap back into focus, and objects hidden in plain sight take on newfound import. Of all the Potter films, only Prisoner of Azkaban dared to be distinctly cinematic in its sensibilities, but every subsequent film has at least been presented as a genuine story with robust emotional and psychological dimensions, rather than a rote checklist of narrative minutiae. For all its grim shapelessness, Deathly Hallows presents its share of worthwhile humane indulgences, such as Ron’s chilling eagerness to torture one of Voldemort’s Death Eaters, or a moment where Harry and Hermione, situated at an emotional nadir, dance sheepishly to a scratchy tune emanating from a “wizard wireless”. The film has its share of emotional fumbles, however, as in its protracted mourning over the demise of an unappealing, mostly forgotten character. Consistent with the prior films, the most appealing feature of Deathly Hallows is the manner in which the filmmakers drape earnest adolescent allure over an ornately realized fantasy world. The film doesn’t offer as many fresh sights as its predecessors, save for an entrancing animated sequence dramatizing the legend of the Hallows in silhouettes. That said, Yates’ latest chapter ensnares countless characters, creatures, locales, phenomena, and motifs that we’ve seen before, often presented in a slightly different key. The Ministry of Magic, first glimpsed in Order of the Phoenix, has been transformed from a quirky bureaucratic labyrinth into a fascistic edifice of propaganda and thought-policing, where uncloaked dementors twitch on their leashes and the vile, pink-garbed Dolores Umbridge (Imelda Staunton) is enthroned as a simpering inquisitor. This sort of repurposing privileges the uncanny shock of change over the glint of novelty, echoing the film’s bleak treatment of childhood’s demise.Â For all his missteps as a storyteller, Yates has done an admirable job of zeroing in on the emotional nodes at the core of Rowling’s tale, chiefly its mournful, frightening depiction of adulthood, so replete with moral confusion, mortal dread, and sexual anxiety. Deathly Hallows is ultimately a tale about the putting away of childish things, a marathon parable that presents rites of passage as opportunities to revisit the familiar with fresh eyes. In Harry’s dire case, every glance reveals deeper shadows: mentors become peers with all-too-human failings, the banalities of everyday life deny him a comforting refuge, and the temptation of cowardice over righteousness waxes daily.